Verizon Wireless and AT&T are locked in a war over who has the largest 4G coverage in the sense that “largest 4g coverage” is or should be the main reason for consumers to choose an operator or another. They are both good in different service plans so choose wisely. Verizon and AT&T are the main US carriers to offer 4G LTE technology and their advertising campaigns are based on this fact. This however shouldn’t be the main criteria when deciding which carrier to opt for. However, the two carriers also seem to promote national coverage as one of the main things that makes them stand out. Look at AT&T as their commercial focus is on “AT&T. 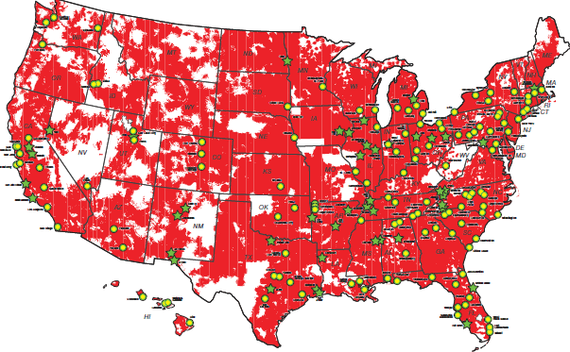 The nation’s largest 4G network, covering 2000 more 4G cities than Verizon.”. But is this that important to users? After all, who travels frequently and extensively to care so much for national coverage? Surely users do more than travel from one state to another just to check whether the coverage claims are true or not. AT&T also claims that it has the “largest 4G” network whereas Verizon Wireless claims it has the “most 4G LTE.” But is ‘who has the most 4G LTE coverage’ really relevant when choosing between carriers? Verizon Wireless has been focusing lately on employing LTE and it all paid off as Verizon is currently the leader in terms of 4G LTE coverage. To support that, their ad campaigns ends with “It doesn’t matter how you present it. Verizon. More 4G LTE coverage than all other networks combined”. However, AT&T claims that Verizon Wireless users lose the LTE frequently and are forced to fall back on the 3G network, with transfer speeds not even coming close to what a 4G LTE network has got to offer. This claim is true as there have been numerous complaints in this regard but Verizon is working on it and as coverage expands, losing the 4G LTE network will no longer be an issue.